The one million pound food giveaway! Welcome to our £1million food give-away. Our way of thanking you for your support over the past 26 years as without you we wouldn't be here! Pizza GoGo was born in Tottenham back in 1987 and we do our best to support our local communities by creating jobs, supporting UK talent, and ensuring our profits stay in the UK. Our company directors have been the same people from the very first day with full experience and knowledge of the business. This has allowed the business to grow by understanding the customers' needs and striving to provide the best quality products at a fair price without spending excessive amounts of cash on advertising which then have to be passed onto the customer in the cost of the products they purchase. We hope you continue to enjoy our products and services, and we look forward to serving you again real soon! Text "GOGO" to 07937 985 999. The table below shows the products that are up for grabs and how many of each product is available. As everyone who enters is guaranteed to be a winner, you better get in quick as when the products are gone, they are gone! 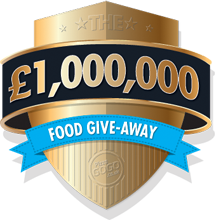 The £1million food give-away will end when all products have been given away or 23:59 on Saturday 30th November 2013, whichever comes sooner! 1. There is no purchase necessary to enter our £1million food give-away. 2. You must be within a Pizza GoGo delivery area to redeem a prize. Please check if there is a store that can deliver to your address before entering. 4. To enter, text "GOGO" to 07937 985 999. You will then receive a reply with a unique link that you can click on and place your order via your mobile handset and your prize will be added to your cart automatically. Alternatively, if you wish to order via a different method you can use the voucher code supplied in the text to redeem your prize. 5. Every text message sent to 07937 985 999 will only incur a standard rate message charged by your network. You will not be charged for the reply delivered to your handset. 6. Only 1 entry per person, per day. Any multiple entries made in a single day will be deemed a mistake and no reply or prize will be sent, however your network may still charge you a standard network rate for that message. 7. All prizes won will remain valid until 23:59 on Saturday 30th November should you wish to redeem the prize at a later date. 8. All prizes are selected at random. 9. Prizes can only be redeemed via our website, www.pizzagogo.co.uk when placing an order that meets our minimum delivery requirements. The typical minimum order value is £9.95. 10. There is no cash value or alternative available for prizes.